In spite of their being almost a month to the day since Moycarkey’s last game in this competition, the wait was worth it when Moycarkey Borris Captain, Aidan Maher was presented with the Joe O’Grady Cup on Sunday last in Holycross. 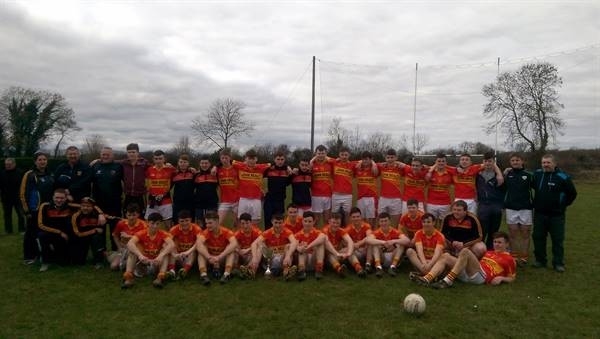 Both teams had met previously in the round games and Moycarkey Borris had defeated Gortnahoe Glengoole by five points. As the second half recommenced scoring remained tight with the two teams swapping two points in the first twelve minutes. Soon after his introduction, JJ Darmody placed the ball in the back of the net to increase Moycarkey’s margin to nine points. In the final quarter of the game Moycarkey dominated the play around the field and on the score board. They added a further five points to Gortnahoe’s two points ensuring Moycarkey’s title, Mid Tipperary Under 21 B Champions. Moycarkey Borris 3-12 Gortnahoe Glengoole 1-7. Aidan Maher received the Joe O’Grady Cup from Jonathan Cullen, Vice Chairman of Mid Tipperary Board and he thanked the team and management. He also, thanked Holycross Ballycahill GAA Club for the use of their excellent facilities and Gortnahoe Glengoole for the competitive game.